When cooking steaks sous vide, we’ve found that searing the meat serves several important purposes. Primarily it adds flavor and texture via the maillard reaction, but it also gives the steak a much more appetizing appearance. Typically when we need to sear a steak we reach for our trusty cast iron skillet, however there are plenty of other methods to get a good sear, some more extreme than others. In addition to the cast iron, we also have on hand a heat gun acquired to fix a YLOD problem, and a propane torch specifically designed for searing foods that have been cooked sous vide. Which method of searing (cast iron, heat gun, or propane torch) is best for searing steaks? The cast iron skillet is a tried and true method, however not being able to see the meat as it’s searing can lead to under or overly seared meat. Both the torch and the heat gun will allow us to see the meat as it’s being seared which should allow us to better gauge when to stop. In theory the heat gun gets hot enough (1076ºF) to sear meat, however the relatively low heat capacity of air means the searing process might take a long time with the heat gun, possibly leading to over cooking the meat in the process. The torch should certainly have enough heat to sear the steak quickly, but propane has a very distinctive smell when it burns and may possibly impart unpleasant flavors. There is also the slight chance of igniting the fat in the steak leading to nasty burnt flavors. Place steaks into zip-top bags removing as much air as possible. Start heating water bath using the immersion circulator. Start baked potato (optional but worth it). Sous vide steaks for 1 hour at 125ºF. Remove steaks and mass them. Sear the steaks one at a time making note of time involved. Cast iron: heat pan to 500-600ºF (according to infrared thermometer), add steak, sear 1 minute, flip with tongs, sear one more minute, remove from skillet. Torch: follow this instructional video (note: we did not use aging sauce), until seared approximately to cast iron levels. Heat gun: repeat torch procedure using head gun instead, again using cast iron results as a guide for when to stop. Cover each seared steak with aluminium foil while other steaks are seared/measured. Mass steaks again after resting. Move steaks to sheet pan and move to warm (~280ºF) oven for 5 minutes to reheat, if needed. Serve steaks science style for tasting, seasoning as needed. Unseared steaks after being patted dry. Searing methods will be A) cast iron, B) propane torch, C) heat gun. During the actual searing there were a few glitches. The cast iron heated up faster than we were ready for and also heated somewhat irregularly, so instead of the originally planned 400-500ºF, the skillet that was closer to 600ºF. Perhaps preheating the skillet in the oven would provide more even heating. The propane torch shuts itself off if you hold it at an incorrect angle, so while searing the first side the torch had to be restarted twice before I got the hang of it. The heat gun’s main issue was that it took a lot longer and was awkward to hold above the steak for so long. Towards the end of the second side I did notice that moving the heat gun more slowly resulted in much faster browning, so it may have just been a technique issue. We also took measurements to determine the speed and relative cost of each searing method. The propane torch was clearly the winner for speed with zero heat-up time and less than a minute per side. The heat gun was certainly the slowest at 5 minutes per side, but that may have been due to moving the heat gun too quickly. For the propane torch and heat gun we were also able to take measurements that allow us to compute the approximate cost of searing a single steak. The propane torch used 6 grams of fuel. At current prices of approximately $4 for a 16.4 oz (465g) propane canister this comes out to about 5.16¢ to sear a single steak. The heat gun consumed 0.19 kWh of electricity during its 10 minutes of searing. We pay 21.967¢ per kWh (including per kWh fees) so the total cost for searing the steak with the heat gun was 4.17¢. The heat gun is the clear cost winner even without considering costs associated with acquiring new propane canisters. 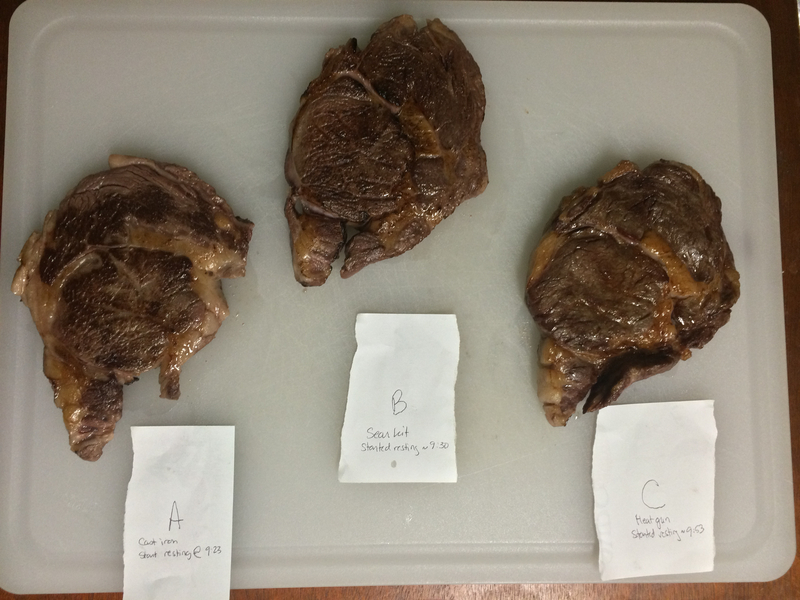 Since meat loses mass when cooked we measured the mass at various stages. Since we weren’t interested in the sous vide portion of cooking in this experiment, we only massed the steaks after sous vide, after patting dry, and again after a post sear rest. Patting the steaks dry removed between 9.0g and 9.2g of fluid from each steak. The steak seared with the propane torch lost the least mass 25.0g (7.5%), the heat gun steak lost the most 37.5g (11.3%) while the cast iron steak lost 32.4g (9.5%). While it’s hard to quantify exactly how this mass is lost, it seemed to be mostly water and rendered fat. In the case of the propane torch the melted fat often flared up possibly leaving behind unburned residue. With the heat gun and the cast iron skillet, the fats dripped away without igniting possibly carrying away more mass. The longer sear time of the heat gun may have allowed more fat to to be rendered out of the steak as fat renders at a lower temperature (130-140ºF) than is needed for the maillard reaction (310ºF). Seared and rested steaks. Searing methods were A) cast iron, B) propane torch, C) heat gun. Despite using three radically different searing methods, all three steaks were excellent. However in a side-by-side comparison there were some noticeable differences between them. Some of them did have some unexpected flavors and textures, some good, some bad. A summary of the most notable tasting notes are given below. Cast Iron Very subtle burnt popcorn flavor. Favorite! Propane Torch Weird burnt popcorn flavor. Least Favorite. Odd tongue texture, topographically speaking. Seems like a burnt microwave popcorn flavor. Heat Gun Had an unexpectedly buttery mouth feel. Favorite! Seems over cooked, but has a nice mouth feel. Looking at the cross sections of each steak, it’s clear that they all have a similar level of doneness. The one exception is the heat gun steak (C in image below) which has a noticeably more done bit on the top side, probably due to the longer searing time required by the heat gun. 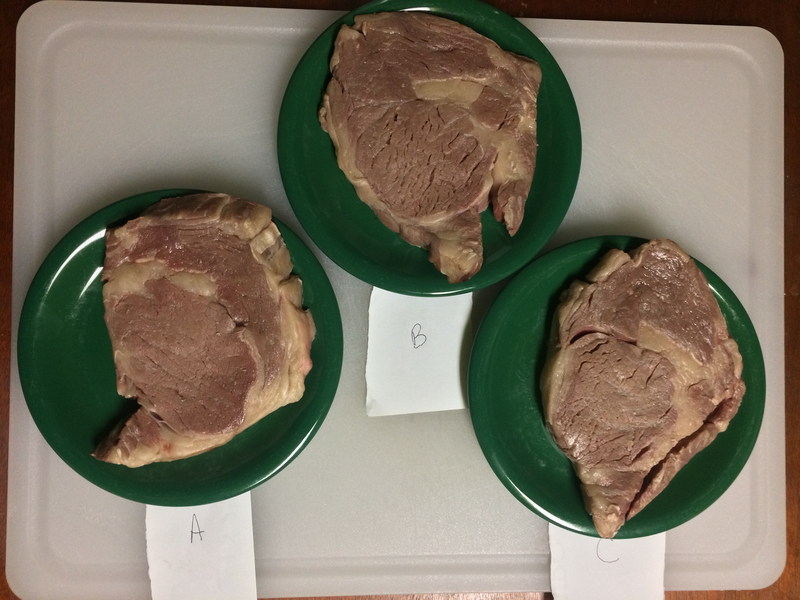 Cross sections of each steak: A) cast iron, B) propane torch, C) heat gun. The flame from the torch does a surprisingly good job at hiding the steak making it difficult to continuously gauge doneness. The underside of the heat gun steak ended up with unusual lines corresponding to the bars on the searing rack. It’s unclear as to what heating mechanism may have caused these lines. One steak ended up looking like the Millennium Falcon. Having tried three different searing methods side by side, the results are noticeably different. Taken individually, each steak was excellent. Each method has its strong and weak points which are summarized in the table below. Cast Iron Any well stocked kitchen already has one. Requires far less skill to get an even sear. Can handle two steaks at a time. Difficult to control temperature and degree of searing. Can produce a lot of smoke. Impressive to watch. Can impart a burnt popcorn flavor. Heat Gun Produces a nice fatty/butter mouth feel. Doesn’t require fuel canisters. Can be very time consuming. Heat gun can get very heavy. Given these results each searing method may have its place in the modern kitchen. While our trusty cast iron will continue to be our go-to searing method, I find the heat gun results warrant further practice with that technique. How does aging sauce affect the searing process? How much effect does technique have on the quality of sear when using a heat gun or a torch? Patting the meat dry makes sense from a heat transfer perspective, but what effect does the removal of any proteins in that fluid have on flavor? When fat is burned, what percent residual mass is left. Would specially calibrated light filters be able to block the light from the yellow flame that obscures the meat when using the torch? How would these three methods compare on a leaner cut of meat. Would a heat gun or torch work well for cooking a steak from raw?